Students eat hot dogs at the Hot Dog Caper. The Cal Poly Pomona Foundation will travel back to the 1980s and host the year’s gnarliest bash at University Park with free food, live music and 80s themed entertainment. The Foundation’s 35th Annual Hot Dog Caper is Thursday, Oct. 4 at 11:30 a.m. The event will bring together students, faculty and staff to enjoy free hot dogs, chips, popsicles, drinks and entertainment. Live music, balloon artists, a replica DeLorean and more will be present to welcome all to the 80s themed fun-filled event. During the event, guests can get their photos taken at two photo booths, get an airbrush tattoo, get their face painted, meet iconic 1980s legends and enjoy a slice of cake in celebration of Cal Poly Pomona’s 80th anniversary. Attendees will also have the opportunity to sample craft sodas from Innovation Brew Works, sample items from the newly opened Saddles Café and more. Every year, hundreds of volunteers from all throughout campus, including administrators, staff and athletes, pass out free food and drinks to all attendees. Last year, Hot Dog Caper volunteers served 14,460 hot dogs and veggie dogs, 8,200 bags of chips, 16,248 beverages and 7,776 popsicles. 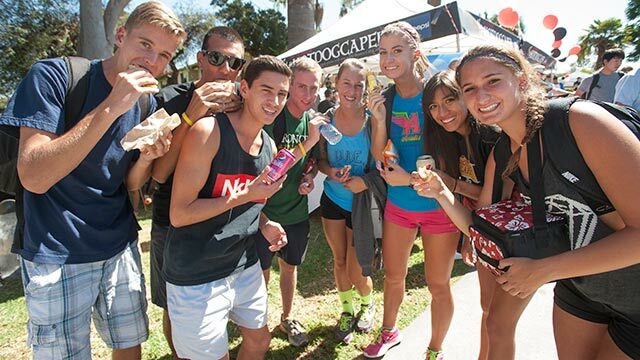 The Hot Dog Caper is made possible through foundation’s partnerships with Cal Poly Pomona, Pepsi Beverages Company, Associated Students Inc., Facilities Planning & Management, Hoffy, First Class Vending and Bronco Athletics. The Hot Dog Caper is just one of the many ways the Cal Poly Pomona Foundation, which opened its doors in 1966, and campus partners give back to the university. Over the past 50 years, the Foundation has given millions of dollars to the university to fund numerous campus programs, scholarships and infrastructure. For more details and to view photos/video of last year’s Hot Dog Caper, visit the website.